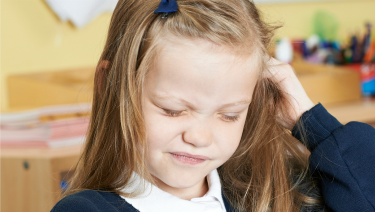 ​​Head lice are a common problem that usually affects school-aged children and their families. They can attach to the hair of anyone's head. It doesn't matter if the hair is clean or dirty. Head lice are also found worldwide in all different places, such as in homes or schools or the country or city. And it doesn't matter how clean, dirty, rich, or poor the place or person is. Though head lice may be a nuisance, they don't cause serious illness or carry any diseases. Head lice can be treated at home, but it's important to check with the doctor first. Here is information from the American Academy of Pediatrics to help parents and caregivers check for, treat, and prevent the spread of head lice. Head lice are tiny bugs about the size of a sesame seed (2–3 mm long [mm stands for millimeter]). Their bodies are usually pale and gray, but their color may vary. One of these tiny bugs is called a louse. Head lice feed on small amounts of blood from the scalp. They can usually live 1 to 2 days without blood meal. Lice lay and attach their eggs to hair close to the scalp. The eggs and their shell casings are called nits. They are oval and about the size of a knot in thread (0.8 mm long and 0.3 mm wide) and usually yellow to white. Some nits may blend in with some people's hair color, making them hard to see, and are often confused for dandruff or hair spray droplets. Nits attach to the hair with a sticky substance that holds them firmly in place. After the eggs hatch, the empty nits stay on the hair shaft. ​What is the life cycle of head lice? Head lice live about 28 days. They develop in 3 phases: egg (also called a nit), nymph, and adult louse. Egg or nit. Eggs or nits hatch in 6 to 9 days. Eggs are usually found within 4 to 6 mm of the scalp and do not survive if they are farther away. Nymph. The nymph looks like an adult head louse but is much smaller (about the size of a pinhead [1.5 mm]). Nymphs become adults about 7 days after hatching. Adult louse. An adult louse can multiply fast and lay up to 10 eggs a day. It takes only about 12 to 14 days for newly hatched eggs to reach adulthood. This cycle can repeat itself every 3 weeks if head lice are left untreated. How common are head lice? Head lice are most common in preschool- and elementary school–aged children. Each year millions of school-aged children in the United States get head lice. However, anyone can get head lice. Head lice are found worldwide. Head lice are crawling insects. They cannot jump, hop, or fly. The main way head lice spread is from close, prolonged head-to-head contact. There is a very small chance that head lice will spread by sharing items such as combs, brushes, and hats. Itching on the areas where head lice are present is the most common symptom. However, it may take up to 4 to 6 weeks after lice get on the scalp before the scalp becomes sensitive to the lice saliva and begins to itch. Most of the itching happens behind the ears or at the back of the neck. Also, itching caused by head lice can last for weeks, even after the lice are gone. How do you check for head lice? Regular checks for head lice are a good way to spot head lice before they have time to multiply and infest (are present in large numbers) your child's head. Seat your child in a brightly lit room. Look for crawling lice and for nits on your child's scalp a section at a time. Live lice are hard to find. They avoid light and move quickly. Nits will look like small white or yellow-brown specks and be firmly attached to the hair near the scalp. The easiest place to find them is at the hairline at the back of the neck or behind the ears. Nits can be confused with many other things such as dandruff, dirt particles, or hair spray droplets. The way to tell the difference is that nits are firmly attached to hair, while dandruff, dirt, or other particles are not. Use a fine-tooth comb to help you search the scalp section by section. What is the comb-out method? The comb-out method can be used to help check for nits and head lice or to help remove nits and head lice after head lice treatment. However, the comb-out method usually doesn't work on its own to get rid of head lice. Step 1: Wet your child's hair. Step 2: Use a fine-tooth comb and comb through your child's hair in small sections. Step 3: After each comb-through, wipe the comb on a wet paper towel. Examine the scalp, comb, and paper towel carefully. Step 4: Repeat steps 2 and 3 until you've combed through all of your child's hair. Check with your child's doctor before beginning any head lice treatment. The most effective way to treat head lice is with head lice medicine. After each treatment, using the comb-out method every 2 to 3 days for 2 to 3 weeks may help remove the nits and eggs. Head lice medicine should be used only when it is certain that your child has living head lice. Remember, check with your child's doctor before starting any head lice medicine. Also, when head lice medicines are used, it is important to use them safely. Follow the directions on the package exactly as written. Never let children apply the medicine. Medicine should be applied by an adult. Do not use medicine on a child 2 years or younger without first checking with your child's doctor. Do not use or apply medicine to children if you are pregnant or breastfeeding without first checking with your doctor. Always rinse the medicine off over a sink and not during a shower or bath, so the medicine doesn't run off the head onto other areas of skin. Place your child's head over a sink and rinse the medicine off with warm water (not hot water). Never place a plastic bag on a child's head. Do not leave a child alone with medicine in his or her hair. Store medicine in a locked cabinet, out of sight and reach of children. Check with your child's doctor before beginning a second or third treatment. Your child may need repeat treatment 7 to 9 or 9 to 10 days after the first treatment depending on the medicine. Ask your child's doctor if you have any questions or if treatments you have tried have not gotten rid of lice. Warning: Never use dangerous products like gasoline or kerosene or medicines made for use on animals! Also, do not use home remedies, such as petroleum jelly, mayonnaise, tub margarine, herbal oils, or olive oil, because no studies prove they work. What head lice medicines are available? Check with your child's doctor before beginning any treatment. See "Head Lice Medicines" chart for a list of head lice medicines approved by the US Food and Drug Administration. What else do I need to know about treating head lice? You may want to wash your child's clothes, towels, hats, and bed linens in hot water and dry on high heat if they were used within 2 days before head lice were found and treated. You do not need to throw these items away. Items that cannot be washed may be dry-cleaned or sealed in a plastic bag for 2 weeks. Do not spray pesticides in your home. They can expose your family to dangerous chemicals and are not needed when you treat your child's scalp and hair properly. All household members and close contacts should also be checked and treated if necessary. Some schools h​ave "no-nit" policies stating that students who still have nits in their hair ​​​cannot return to school. The American Academy of Pediatrics and National Association of School Nurses discourage such policies and believe a child should not miss or be excluded from school because of head lice. Head lice don't put your child at risk for any serious health problems. Products should be used only if those products are safe. If your child has head lice, work quickly but safely to treat your child to prevent the head lice from spreading.